Guest bedroom with full bath. Walk-behind Bar – wine room is to the right. Down the hall are the massage rooms and media room. Family room – walk-behind bar is to the right, guest bedrooms are to the left. Half-way down the stairs is the ski locker room and laundry room. Family room with entry to the right. Lot 3 – Beaver Creek, Beaver Creek Mountain, Eagle County, CO; 6,600 s.f. ; 2004. Contractor: Summit Habitats Inc. This 9,000 s.f. home is located on Lot 3 in Beaver Creek. It features indigenous materials such as wood columns, beams, and trusses, and sandstone. The home is designed to take advantage of views of Beaver Creek mountain and sunset views over the golf course. This residence has five bedrooms including the master and primary guest bedrooms, six baths, and two powder rooms. Adjacent to the kitchen is the dining room with access to an outdoor deck with sunken hot tub and fire pit overlooking the golf course.. The luxurious master bedroom also has its own fireplace and outdoor deck access. The residence also includes a family room with wine cellar and walk-behind bar, home theater, massage room for two and three car garage. 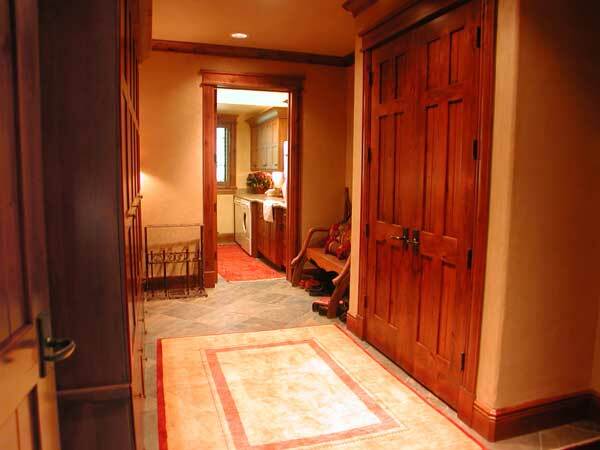 The main level of the residence includes a powder room, entry/foyer with cathedral ceilings, open floorplan with the great room opening onto dining room and deck. Large gourmet kitchen, hearth room and primary guest suite both opening onto patio with gas barbeque and inviting seating area. The lower level of this home combines beauty and comfort so seemlessly your guests may never want to leave. At mezzanine level is a convenient ski storage locker and laundry room. Continue down stairs to a large and comfortable family room with walk-behind bar and wineroom. Two guest rooms, each with it’s own full bath are off the family room. As you pass the kitchen, you enter a sumptious massage room, and through the massage room for two is a media room with large screen and old fashioned popcorn maker. Finally, the upper level of the residence includes a study (not shown), the master bedroom, and an additional guest bedroom. A loft area overlooks the great room.